The general acceptance of globalization and free trade across most national governments has led to the massive proliferation of foreign goods across the globe within the past few decades. As a result, the consumer adoption of imported products has been researched extensively as well; however, the majority of the studies have focused on developed countries, leaving less developed and developing countries vastly unexplored when compared to their counterparts. Research has also been found lacking in areas pertaining to the potential disruption that foreign product adoption has on the consumers’ purchase decision process. Key determinants such as consumer ethnocentrism (i.e., CET) and animosity warrant further investigation into how and where these determinants exert the most influence during the purchase decision process. This research seeks to examine the effects of CET upon the attitude formation stage of the process to assess its impact upon consumers’ attitude toward the use of foreign products. This study specifically examines the consequences of CET within Mexico, a country recognized as an emerging market by many reputable sources of international economic information. The study utilized a quasi-experimental group survey research design and multiple methods of analysis, producing results to support all three research hypotheses. Firstly, CET was shown to have a significant positive effect upon attitude toward the use of products imported from a developing country. Secondly, CET displayed a significant negative direct effect upon attitude toward the use of products imported from a developed country. Lastly, CET exhibited a significant positive effect upon attitude toward the use of domestic products. The general conclusion is that CET significantly impacts the product adoption process via consumers’ attitude toward the product. This effect is negative when the product is made in a developing market that is either foreign or domestic. Conversely, this effect is positive when the product is manufactured in a developed market. These results suggest that countries whose consumer market exhibits high levels of CET prefer products that are domestically produced. Additionally, ethnocentric consumers of developing countries may actually prefer products from other developing countries over developed countries due to perceptions of similarity and connectedness with that developing country. 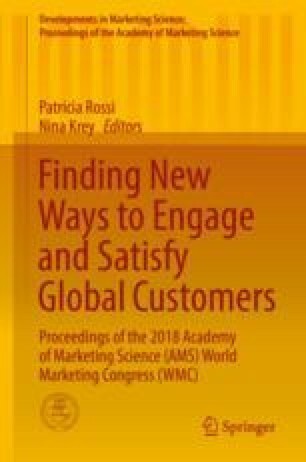 These findings lead to managerial applications whereby marketing efforts (e.g., forming joint ventures and strategic alliances) can be utilized to bring market similarities to the forefront when advertising to these consumers.